Well it seems the new hot topic is Kwik Way Burgers at 500 Lake Park Ave has reopened. A new owner by the name of Gary Rizzo(owner of the now closed Somerset) has reopened the location with a new restaurant and altered menu but kept the old Kwik Way name. Just kidding! Here we are in 2014 and they have changed the name to Park Way for some reason. I’m a little confused as to why the extreme excitement as if this place was actually missed? If I recall many people complained about this place all the time. The same people that complained and protested Walgreen’s but then stopped saying a word when it was paired with a Trader Joe’s. These people even made claims it was attracting a late night rowdy crowd that was not wanted in the Grand Lake neighborhood. A crowd that littered without a thought or care and disrespected the neighborhood. If you check it’s old Yelp it only has 2 stars! They also fought it when a Fat Burger wanted to open up at this location. And fought the McDonald’s option. But let this Burger place right back in? What makes it any different? So my question is why the hype now? Are you all new to Oakland and just don’t know? Or did you all forget how you felt about it before it closed down? Has anything changed? Maybe the fact that the Heart & Dagger is next door now and not the Serenader? I can see that changing the crowd completely. But the food? Still the same or slightly altered menu. I think it’s mighty bold to try and put yet another Burger Joint upon us with all of the options on Grand including True Burger and Ahn’s Burger so close. Maybe this place will have later hours? But again that was what you opposed before. As for the food, sub par, over priced and all around not worth it. Either way, here’s the menu and good luck with it. I would much rather see something else go here. Leave some comments about the food or experiences you have had here. 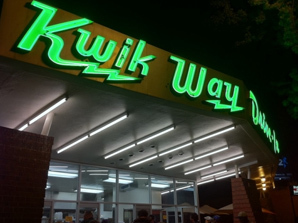 My husband and I were SO sad when Park Way (new Kwik Way) suddenly closed last summer. It was our go to neighborhood place. The beet salad, the broccoli salad, the Cobb salad, were all excellent, very fresh and nicely dressed. The burgers (roasted pepper was my favorite) were great. Organic beef was an option, as was a gluten free bun. They also had a fresh soup of the day. I HATE the landlords for setting a rent that was impossible to pay. It has been a real loss the the neighborhood. I sure miss those salads, and I sure hate the misleading and WRONG title of this article. I hope Gary Rizzo finds another site to provide his delicious and fairly priced quality ‘fast’ food. I guess we have a few burger places to check out!yummmm! I was there a month ago, & I remember more on the menu. Where did u get this one?? Meatloaf on sourdough, delicious. Granted i've only been here twice, I think its great. Who reviews a resturaunt re-opening based on how much out sucked in the past, only to come to the conclusion, that it still must such?!? There you have it. I don’t know for sure but if their prices are higher then maybe it’s because of the “different crowd” patronizing it. Probably those two reasons. Makes the area around the theater more of a hangout spot, and the lights from KW light up the public park between it and 580 too. Do younhave a picture. I was around there a couple of weeks ago and the place was partially boarded up, had grafffit all over it and had this ugly lime green paint on it. It looked like it was months away from opening. It looked awful. I hope they did a good job with the final product. That small street looks kind of run down. The Cuban restaurant “Cana” building had a boarded up window on the second floor. They need to clean that block up.